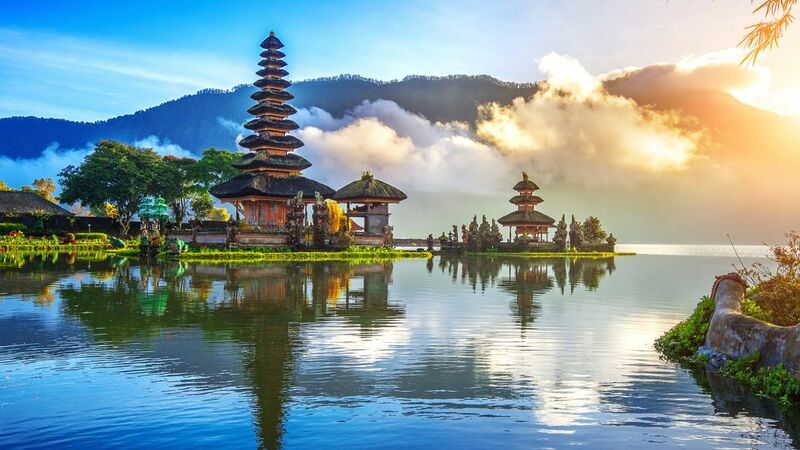 Detailed Itinerary of 16 days Bali Tour is as appended below. You will leave the USA for your flight to Bali. The adventure begins! Cross international dateline, you will lose this day; regain it on the return flight. Drive to Munduk and Bedugul. See beautiful countryside and rice terraces along the way as well as the beauty of twin lakes, Buyan and Tamblingan. Stops along the way, the waterfall at Munduk, then Pura Ulun Danu Beratan. Lunch at Local Restaurant. Next stop at Mengwi, see the water garden temple Taman Ayun. Then visit the Batur area. Check you into your boutique local hotel. Enjoy nature walks in the valley of the volcano area. Your guide will show you the best of the area. B, L, D.
Today is a free day to enjoy the beach. Fly to Yogyakarta. Upon arrival visit the Water Castle, including the Underground Mosque. After lunch you will visit Prambanan. Yogya City Tour & Borobudur Temple Tour on private basis. Bali Archaeological Museum, housing rare arts and artefacts. Batur Caldera Lake, also known as the Kintamani Volcano. Seeing ancient artifacts at the Archaeological Museum. Panoramic views of rice fields, mountains & surroundings. Experience focused on Bali’s art & cultural heritage. Spectacular sunset views from Bali’s western coastlin.